Norka (now Nekrasovo) is located in Saratov Province (Oblast). 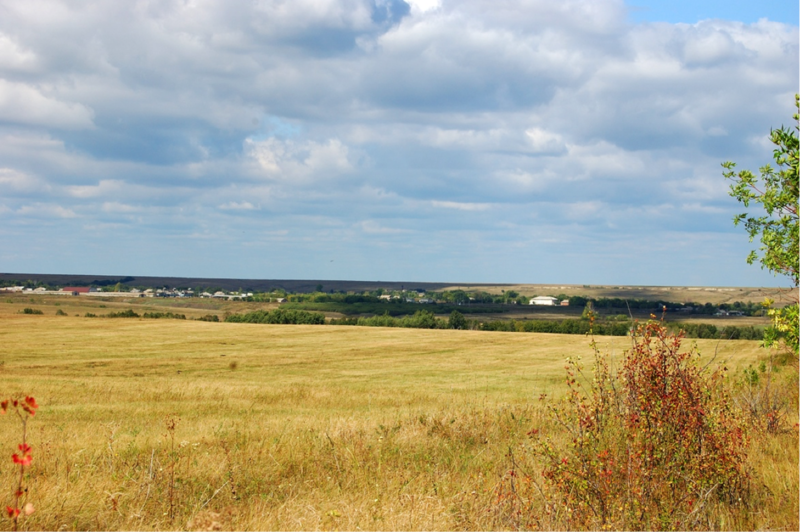 This area is part of the vast Eurasian Steppe. The geographic coordinates of the Norka colony are 51° 09' North latitude and 45° 18' East longitude. Norka is located at about the same latitude as Saskatoon, Canada. Summers are hot and dry with an abundance of sunny days. Daytime temperatures in the summer of +30°C (86°F) or higher are commonplace. The warmest month is July with a daily mean temperature near +23°C (73°F). Snow and ice are dominant during the winter season. Saratov receives about 163 centimeters (64 inches) of snowfall annually. Days well above freezing and nights below −25°C (−13°F) both occur in the winter. The coldest month is February with a mean temperature of −8°C (18°F). A view of Norka in 2006. The old Mitteldorf schoolhouse is the large white building to the right of center. Photograph courtesy of Steve Schreiber. Climate in Saratov from "Saratov." Wikipedia. Wikimedia Foundation, Web.